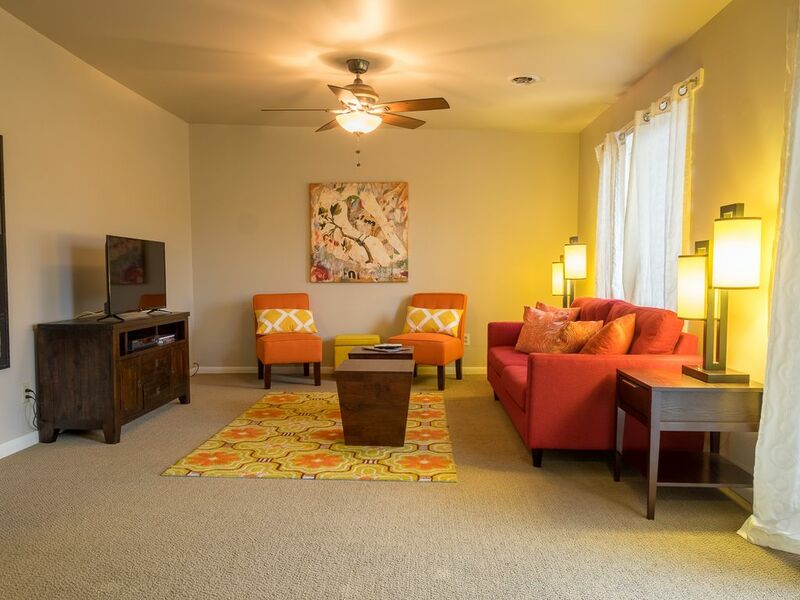 With a private entrance and outdoor deck, this two-bedroom/one-bath UPSTAIRS apartment provides the comforts of a home away from home: roomy living room, full kitchen, full-size washer and dryer, office nook, smart TV, wi-fi and cable. The master bedroom has a super comfy queen-size memory foam Sleepmade mattress and the smaller bedroom has a double. With an office nook, it's perfect for a professional working temporarily in Nashville or visitors just looking to have a great time. All this and so close to all that makes Nashville so great! This is an upstairs apartment. Access is on the side of the house. english, I can speak just a tiny bit of Spanish. I'm a native of this area and love sharing my home town with others. Nashville is a great place to live and visit! There's something for everyone here. I've lived in this part of Nashville for decades and watched it grow. Throughout, I have seen this town become a city that still has the small-town hospitality where strangers smile at each other and allow drivers to get in their lane during traffic congestion. While Nashville is southern through and through, it has its own spin on a more cosmopolitan lifestyle without being too stuffy. You're sure to find something here that makes you want to return again and again! My 1930's bungalow has a historic feel too it but the apartment is given a modern twist with lots of color and comfort. It's in the heart of all that I love: the universities, the parks, the music, the food, I could go on and on. If you don't want to drive in traffic, you can take a stroll a couple of blocks away and find someplace interesting to explore. Or you can just relax on the private deck with a good book or a nap. (There's even a bug spray available during mosquito season.) Free street parking is nearly always available out front unless a big event like the Music City Marathon is going on and you leave the premises during that time. We can temporarily accommodate these situations with driveway parking though. Public transportation is available nearby (the Green bus is free to ride downtown from the Gulch). You can also take advantage of a short ride using Uber, Lyft, Joy Ride, cab rides and even Nashville B-cycle. I understand there are bike rentals and tours at Green Fleet Bikes, 2 blocks away. Full bathroom with tub/shower, soap, shampoo and conditioner, hair dryer, etc. There's pub table with 2 stools but also a deck and extra chairs. There are few books available. Bike rentals are nearby but not provided on site. Scooters are found all over town as well. Shampoo, conditioner and soap dispensers are available for use in the bathroom. Dish soap and kitchen basics are also available. Bug spray is available if planning time on the back deck. This private UPSTAIRS apartment in a 1930s bungalow is located in a popular urban neighborhood within walking distance to some of the hottest spots of Music City. You're sure to get the truest sense of Nashville during your stay here. Just two miles from downtown, and 10 miles from the Nashville International Airport, you'll discover Music Row and Belmont University are just steps away, with Vanderbilt University a short stroll away, and coffee shops, art galleries, restaurants, craft breweries, and of course music venues and studios at every turn. You'll even find great greenways and hiking trails just a few minutes' drive away. Free street parking is nearly always available out front unless a big event like the Music City Marathon is going on and you leave the premises during that time. We can temporarily accommodate these situations with driveway parking though. Also, a parking permit is available during the weekdays. Public transportation is available nearby (the Green bus is free to ride downtown from the Gulch). You can also take advantage of a short ride using Uber, Lyft, Joy Ride, cab rides and even Nashville B-cycle.